I bought these vintage tins at the car boot fair on Sunday. 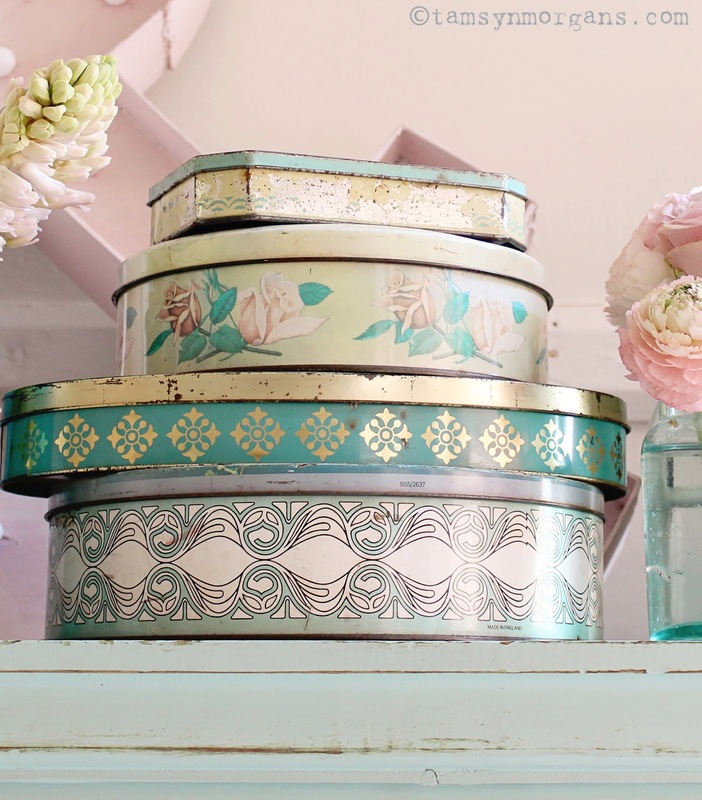 At first I completely fell in love with the floral images on the top of these old biscuit tins (I’ll be posting pictures of those this weekend), but it was only when I got home and stacked them on top of each other, that I realised how utterly divine the patterns on the sides of them were. 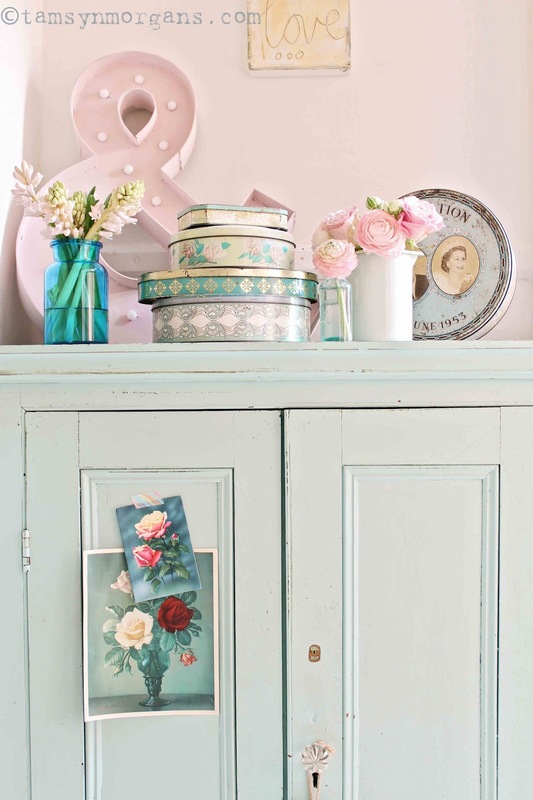 The mixture of retro, floral and those shades of minty green – it was like they were meant to be together. I’m pretty obsessed with colour at the moment, especially shades of green all the way up to vibrant turquoise and teal. I just want to splash gorgeous, rich, vibrant colour everywhere! I’ve been thinking for a long time about painting the inside of my front door a zingy turquoise, and I’m going to have a look at colours later, watch this space. 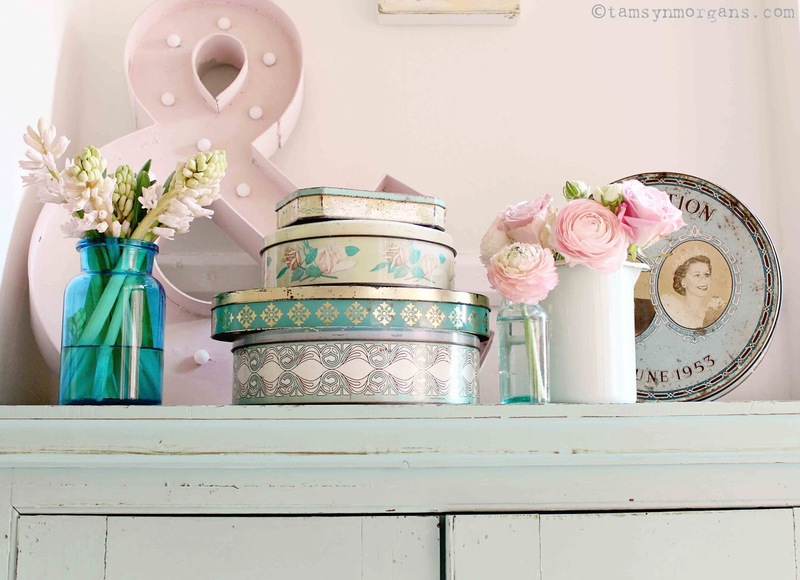 The tins look very at home on top of my much loved vintage cupboard, along with my flower market blooms, so this seemed to be perfect for my Styling The seasons post for April. Head over to Katy’s blog Apartment Apothecary and Charlotte at Lotts and Lots to see lots of gorgeous Styling The Seasons posts, or search the hashtag #StylingTheSeasons on Instagram. You can join in on Instagram by styling your own surface according to what this month means to you! The children and I are having friends and their two boys over for a long, lazy lunch tomorrow, which will not only be fun, but also gives me the chance to get the crank out and wind the dining table open to insert the middle leaf (there’s something about that little process which I find so satisfying). Lots of laughter, food, and maybe a little wine!